One of the hypes of 2017 is definitely glitter. When it comes to fashion, make-up and hair, glitter has been a huge trend for a couple of years and now it's made the crossover to the weirdest thing ever: food. You think glitter is only there to spark up your occasional rainbow cake or boozy champagne, but it also looks dazzling in coffee, who knew? A small coffee shop in the UK started this phenomenon -literally my entire Facebook feed was trashed with articles about it- and of course other coffee shops couldn't wait to jump on the glitter train and one of those cafés is Palm Vaults. Words can't describe how much I love Palm Vaults. It's a small independent café in Hackney, London and it makes all my #foodiegram dreams come true. The food and drinks look amazing, taste even better and the interior is to die for. Now Hackney is not that close to the city centre. I first took the bus which was obviously a mistake since it took forever and on my second trip I changed to the Overground. 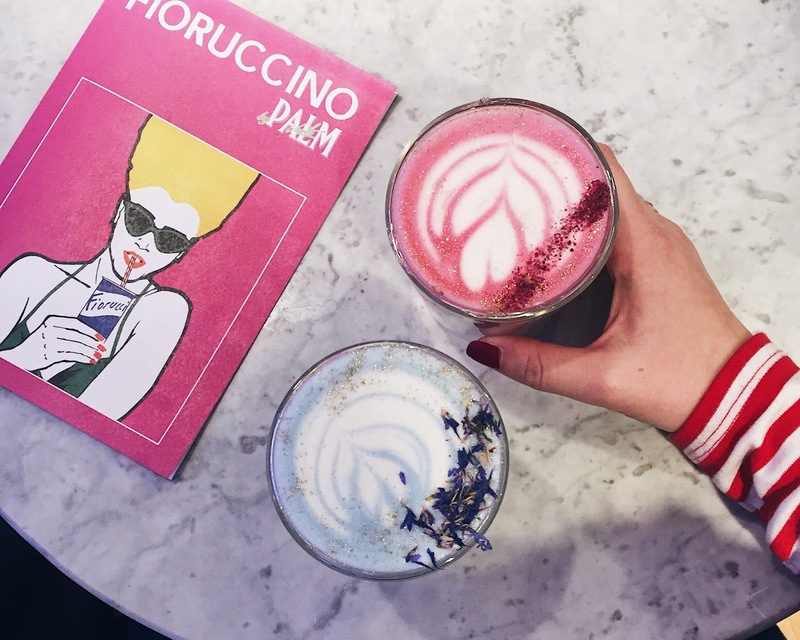 On my last trip I didn't have time to travel that long for a glitter coffee, so I was happy to discover the fact that Palm Vaults has a little pop up in the Fiorucci store in Soho. I'd never heard of the brand Fiorucci before but when I walked inside it looked really cool. Lots of colours, lots of prints and the perfect store to have a Palm Vaults bar. A friend and I wanted to grab a quick latte in there, so we took a seat at the marble tables and had a look at the menu. We both went for a tonic latte in 'Velvet Rose' (beetroot, rosewater, agave and oat milk) and 'Blue Magick' (blue algae, ginger and coconut milk). You are probably thinking: what the heck is a tonic latte? Well, when I ordered it I also had no idea, I just knew that they were pastel coloured and looked too cute to drink. Sprinkle some glitter on top and my day is made. They were quite expensive though, four pounds for each latte with an extra charge for the glitter, but since I was on holiday and I wanted to know what the sparkly fuzz was about I happily ordered it. After taking about a million photos -has to happen with this drink- we both took a sip. I didn't know what I was expecting but I also knew that this was not going to be my new favourite drink. I had the blue one and I can't even describe what it tastes like. A bit weird and funny, not gross, but not super tasty either. My friend didn't like her rosewater latte at all and after a sip I understood why. It was like eating a bouquet of roses, but weirdly enough I didn't hate it. Also you don't taste the glitter at all, so no worries about that! We chatted for a long time and after our lattes were finished we payed and walked through Soho for a bit. 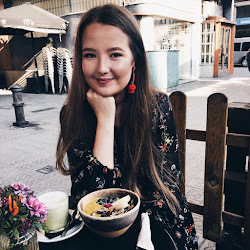 If you are in London I definitely recommend going to Palm Vaults -do choose a normal latte for your sprinkle of glitter- and also grab a bite to eat whilst you’re there. I know their cakes and smoothie bowls are so tasty and well presented. Can't wait to hop back on the Overground to Hackney whenever I have a glitter craving! Have you ever tried a glitter latte before?